Outline Products manufacturers riding floor scrapers powered by propane or electric, also narrow electric scrapers for confined spaces that are elevator acceptable for floor covering removal. Economical floor scraper attachments for walk behind or riding skid steers can be shipped nationwide. We sell high grade scraper blades for flat surfaces and self-dicing carpet removal at wholesale prices. 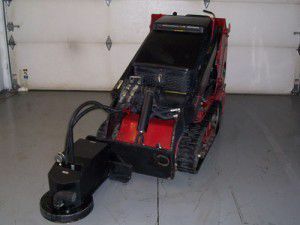 Attachments are also configured for scarifiers to remove epoxy and cement based overlays, rotary horizontal carbide and PCD slicers, to remove elastomeric membrane and reduce elevated concrete joints, removing terrazzo floors, while leveling uneven substrates. Diamond segments can be installed on the horizontal plate grinder to remove coatings, thin set and adhesives for floor preparation. All attachment components can perform in the wet or dry mode. All consumable parts: scraper blades, carbide cutters and carbide ceramic tile removal tips are sold direct to the end users by Outline Products from our Colorado facility at wholesale prices. No middle man or territorial distributors, discounted bulk commodity sales are available. As a surface covering contractor since 1967, Outline Products saw the need for reliable economical floor covering removal and surface preparation equipment. The machines needed to remove a variety of coatings quickly and efficiently without major damage to the substrate base. Each unit either self-propelled or skid steer attachment has a specified task and has the versatility to be used to assist other removal and prep equipment to expedite job completion. In 1996 Outline Products began manufacturing floor covering removal equipment. The goal is to build safe and operator friendly machines that can be used by entry level operators; our product list has grown from our first self-propelled riding floor scraper to over fifteen job specific items. In 2003 the skid steer attachment was developed, with a national inventory of compatible skid steer host machines thru rental agencies. Contractors can rent affordable skid steer units locally, with attachments shipped directly from Outline Products. Floor covering removal is now simplified to create more successful new floor installations with less call backs for product failure.